This step-by-step tutorial will guide you how to insert a jQuery carousel created with Amazing Carousel to Adobe Muse and Adobe Business Catalyst. Here we create a folder names mycarousel. We will use this folder name in next step. Click button Browse, choose a local folder to save carousel files. In field “Add absolute URL”, enter text: http://www.yourwebsite.com/mycarousel/. You need to replace “www.yourwebsite.com” with your own domain name, “mycarousel” is the folder name we created in step 2. Step 4 - In your FTP client software, upload all of the generated files to the folder “mycarousel” which was created in step 2. After uploading, visit http://www.yourwebsite.com/mycarousel/carousel.html, the jQuery carousel should show up and work properly. When visiting the link, you need to replace “www.yourwebsite.com” with your own domain name. In this step, you need to insert the carousel to your webpage. Open the created carousel.html file with a text editor or HTML editor, copy the HTML codes in the body section. The code snippet starts with <!-- Insert to your webpage where you want to display the carousel --> and ends with <!-- End of body section HTML codes -->. 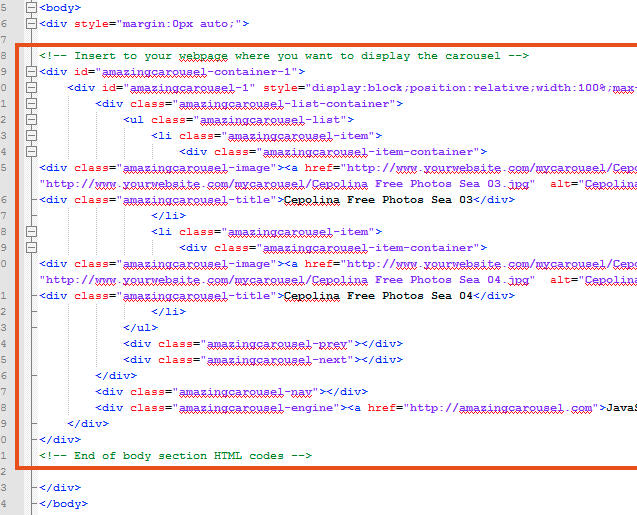 In Abode Muse, click menu Page -> Page Properties, then click Metadata tag, add the following codes to the HTML for <head> box. You need to replace “www.yourwebsite.com” with your own domain name.